The Morris Burner Hostel is a Membership Based Hostel. We have memberships from $10, if you are willing to learn the Burning Man 10 Principles, or for just $20 for a 30-day membership and upwards. 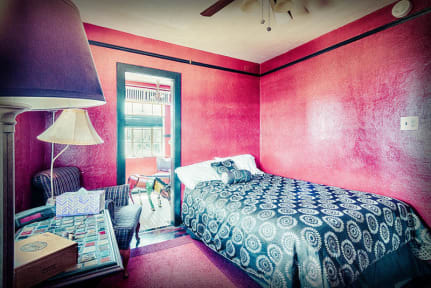 We feature both bunk-style shared traditional 'hostel' style rooms as well as themed art rooms at Morris Burner Hostel. We have two rooms that each have two bunks, or four beds per room, three rooms that have single bunk beds in them, eight individual, private rooms, one double room mini-suite and two full suites that have private baths. Aside from the two suites, all bathroom facilities are shared, as are showers. We have free WiFi, and a full kitchen on property. Our rooms do not have TV's, but there are common areas where it can be accessed. Yard, performance venue with two stages, and bar on-site. No restaurant on-site, but many food choices in walking distance, some with discounts for members! Ample street parking for vehicles, and bike parking in our yard. There's generally something fun happening, come check us out! 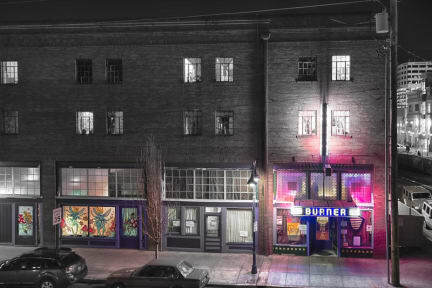 Near the heart of downtown Reno, Nevada, the Morris Burner Hostel is centrally located on historic Highway 40, extending through downtown Reno. We are within walking distance of public transportation, the Amtrak train station, and a short cab ride or bus trip from the Airport. Payment upon arrival by cash, credit cards (MC/Visa/AMEX/Disc), debit cards. Taxes not included - lodging tax 13.50 % per person per night. Membership-based hostel, all guests must have a membership, one will be assessed on check-in if not previously purchased. Not accessible, stairs to get to rooms, no accommodations on ground floor.